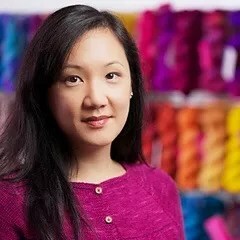 Felicia Lo of Sweet Georgia Yarns was our Guest on Yarn Thing with Marly Bird, and got everyone in the live chat room got all drooly over her yarn colors! Felicia called in from her home in Vancouver, British Columbia. She reminisced with us that she began to knit in grade school and actually sent away for a pamphlet to learn how. When her family went shopping, she would head to a discount department store that had yarn in and admire the needles. She knit her first sweater the year before high school of acrylic (still has it!). Made transition into sewing while in high school and didn’t pick up knitting again until a friend announced she was going to have a baby. Visiting Urban Yarns (Local Yarn Store in that area) and finding all the special yarns, and then Knit-a-Longs…. Felicia starting writing her blog almost ten years ago, in 2004. The next year she discovered spinning, started with a drop spindle and then bought a spinning wheel. At the time, the fiber for spinning available to her was natural white, so she made the next step to dying her yarns, all the while blogging about her experiences. The bright colors of Kool-aid dying to acid dying as made Sweet Georgia Yarns an attractive product! The Sweet Georgia Website is: http://www.sweetgeorgiayarns.com/ DON’T FORGET THE YARN IN THERE! The yarn bases that are chosen with a lot of thought put into how it will wear after you’ve spent all the time to create your garment. However, even in the same pot, yarns will absorb the dye differently. They skeins can be broken up by alternating (Felicia is currently alternating four skeins in a project) but the variations create a unique piece that defines hand-crafting. Patterns are offered through the website for us to see what Sweet Georgia Yarns can do, but are not automatically chosen or included when you purchase the yarn, because Felicia wants to see what you’ll create! There have been designers working with them and they have a new e-book coming out in the fall. There are also Yarn Clubs, currently Sweet Georgia Yarns is accepting Memberships in the Sock Yarn Club (that’s the link) and there will be a Lace Club which closes December 31st. Felicia sounds like a sweetie. I loved hearing how her business has grown even with being a new mommy. Her life might feel like a moonsoon hitting right now but I can hear in her voice how calm and organized she is so things will be in hand shortly. Good luck with the yarns and the new little one. Just looked at the Sweet Georgia website and, wow, it’s a monsoon of choices and ideas! Lovely yarn. Enjoyed the podcast today. Thanks. Caution…after watching Felicia’s Craftsy class, your head will be spinning with a monsoon of new ideas! Loved listening to the fiber artist/entrepreneur behind the fabulous Sweet Georgia yarns! A monsoon would be welcome for a few hours- just enough to get the temps under 100 degrees, and sit inside and knit. It would be even better with some of her Sweet Georgia yarn-the colors are wonderful. I am so in love with Sweet Georgia Yarn <3 !!!! With a MONSOON of choices it works for all types and forms of knitting & crochet projects. I think my very favorite socks are made with Sweet Georgia!!!! I listened with fascination about colors and patterns, this podcast has brought on a monsoon of creativity. Thanks Marly and Felicia! Loved the podcast with Felicia. I first become aware of Felicia’s work in her Craftsy class – it is a wonderful class. I sure wish a Monsoon worth of Sweet Georgia fiber would come my way!! This episode was just a monsoon of inspiration! Felicia, you are so versatile – thanks for sharing your story with us, and Marly, thanks for making it all possible. I must be living under a rock. I have never heard of Sweet Georgia Yarns. Did I need a monsoon to blow the rock away?! Love the wide variety of colors. Another great interview! Sweet Georgia Yarns and Fibers are a monsoon of color. My knitting season is looking like a monsoon with the addition of the Tempest book of designs. Luckily the monsoons of fall will be blowing a change soon and so the cool nights bring out the need for more sweater knitting. What beautiful fiber and yarns Felicia has. Enjoyed reviewing her site and looking forward to my first experience with her yarn. Enjoyed your podcast. I have not heard of Sweet Georgia Yarns, so I learned a lot. I am so glad that we don’t have to worry about monsoons in our part of the country. Marly, you have such exciting guests on your show. I loved hearing about Sweet Georgia Yarns and Fibers. After seeing the monsoon of colors on the website, it is so hard to choose just one! I can’t wait to start knitting with it. I love to knit at the lake when the rain is coming down like a monsoon! My LYS carries Sweet Georgia Yarns and it’s so much fun to get the back story about these yarns which have hit the knitting world like a monsoon with their lovely colors and bases. I love the colors in Sweet Georgia Yarns. The weather lately seems like a monsoon with all the rain we have been having. The only upsides is lots of knitting time. Felicia’s Sweet Georgia yarn colors hit you like a monsoon when you check out her web page! Beautiful! Enjoyed the interview very much. I checked out the Sweet Geargia Yarns website, and love looking at the different yarns and all the beautiful colors! The yarn and fiber clubs sound like a great idea. I wonder if the newest color will be called Monsoon? Thanks again Marly for a great interview! I just love Felicia – I have taken her craftsy class on spinning dyed fiber. I can not recommend it highly enough, it is a monsoon of knowledge. There are so many colours; it’s like a monsoon!! Felicia’s interview brought up a monsoon of ideas. There are a monsoon of sock yarns available, but I learned of Sweet Georgia through a LYS yarn club, who chose some great yarns for us. I made some great socks from Tough Love! Some days feel like a monsoon of activities but wouldn’t have it any other way. Felicia produces some beautiful yarn, like the colorful choices. I would love a monsoon of yarn boxes full of Sweet Georgia yarn to arrive at my door. When we have our monsoon rains (or snowstorms!) here in Michigan and it’s cold and wet, Felicia’s yarns or her class could keep me so cozy!! No monsoons are in my future but I know there will be lots of snow. Love spending the day in front of the fireplace, listening to podcasts and knitting. Can’t wait to knit with Sweet Georgia yarns. They sound so lovely. We don’t have monsoons here in Philadelphia. I love Sweet Georgia yarns, though. Beautiful yarns and colors! Nice and sunny here in California, no monsoons in sight! I learned a MONSOON of new spinning techniques from Felicia Lo’s Craftsy class – Spinning Dyed Fibers. I want a monsoon full of Sweet Georgia yarns! Very interesting podcast! I loved learning about how Sweet Georgia began and to learn about the growth of the company. The growth was similar to a tempest and from that tempest a monsoon of colors are available. I wish we could have a monsoon of this beautiful yarn! Thanks for another great show! I loved hearing about her company and how she got started. It is inspiring to hear that she has her own business with a baby. I have a baby as well and I admire how hard she works. Temptest or monsoon, those yarn colors are pretty amazing. There is such incredible depth and breadth to the choices. Wow! If we were to have a monsoon rain storm – I would want to be curled up with a ball of sweet georgia yarn and my needles.